Chandra Acharya*, 35, is a single mother of two teenage girls, eking out a livelihood by working as a tailor in the day and cleaning houses in the evening. She became a Maoist three years ago because she believed that they would protect workers like her and create better job opportunities. Last week, Chandra was asked to house Maoist supporters in the room she rents in Anamnagar. The room is tiny, badly lit, and can barely fit Chandra and her daughters. The only furniture they have is a narrow wooden bed shoved against a wall, two bamboo stools and a small book shelf that houses their meager utensils. A thin mattress is rolled up on the bed, and Chandra unrolls it every night to sleep on the floor so her two daughters can sleep on the bed. "I have young daughters and am not willing to house strangers I know nothing about," she insisted, and bargained with the Maoist group she is affiliated with to let her simply participate in the protest marches instead of housing cadres. Now, she's marching with flags in the daytime and rushing to shop for food in the evening, before hurrying to clean houses. She leaves her daughters at home with instructions to finish homework and study for school. "This is not the Nepal I want them to grow up in," says Chandra "This is not what I want for my children. I don't want them to see more riots than I have in my lifetime. I want them to go to school, be educated, and have good careers. I'm not sure what this banda thing is going to accomplish in the long run." Last week, forty-three-year-old Norsang Tamang arrived in Kathmandu with a busload of people from villages in Rasuwa. Norsang is a farmer in Gatlang VDC with seven children, the youngest barely three years old. It's sowing season and he doesn't want to be in Kathmandu. His oldest son wasn't feeling too well when he left and his wife can't plough the fields alone. But the Maoists threatened to beat him and his son and wife up if he didn't pack immediately. So he did. Norsang is not even a Maoist. He has no political leanings and no interest in who has power and who does not. "I don't really care who the leader is. I don't care what party is in power as long as they build good schools in the village so my children can learn and become better people, and let me farm in peace," he says. He has had a stomachache since he arrived in Kathmandu, but has no money or any idea where to get medicine. "Where would I go? All the shops are closed," he says "I must return home at the earliest or we won't have enough for the winter. I've already lost so many days." He met a driver he knows from his village and arranged for a ride back home for whenever this is possible. Norsang pulls out a card that the Maoists gave him. "They said I could ride for free if I show this card," he says, showing it to the person next to him. "Dumb," the person reads aloud. "Is that what it says," exclaims Norsang, and pulls it back. "I'm not dumb!" He puts it back in his backpack. It's still unpacked. "I don't take anything out in case I forget to put it back in when I leave. This city is godforsaken, there's no water even to drink. To think that there's a clear lake, Parbat Kunda, right by my house," he says. He's ready to leave the first chance he gets. 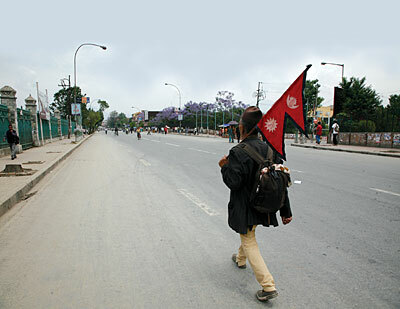 For the last week, he's woken up at dawn and instead of going out to the field to sow, he's followed the crowds through the streets of Kathmandu. Arthur, where are your Maoist-supporting comments for this story? Will you simply chalk this up as a case of the media picking out a few exceptional cases? Or admit that the Maoists are twisting the arms, to put it mildly, of the very people they are purportedly representing? "Most participants at the protest rallies have perhaps come to the city of their own accord. At least some have defied the whip of the Youth Force (the militant youth wing of UML) to respond to the call of local Maoist commissars. But the media coverage in Kathmandu has made it look as if gullible villagers have been either lured or threatened into taking part in protest programs." But since you ask, I'll say that this one seems even more peurile than others of the genre. The character "Norsang" seems a pure reflection of KTM stereotypes of the dumb gaule. The reporter even shifts from pseudo-interview style to reporting as though the reporter was present when he tried to hitch a ride home. Seems like a composite of the sort of gossip about these "aliens" one would expect within the KTM bubble. The character "Chandra" is more convincing. Perhaps the author actually spoke to someone who has been in a Maoist sister organization in KTM for three years and is currently busy protesting during the day, rushing to shop for food afterwards and doing cleaning work in the evening. There would be many thousands like that, making real sacrifices because "This is not the Nepal I want them (her children) to grow up in" and not being sure what the strike will achieve. The reporter says that Chandra was asked to provide accommodation for others like her from outside KTM but had to refuse because she has no room even for herself and her daughters. Again there must be thousands like that. But the reporter managers to twist it so as to sound like an indictment of the Maoists rather than of the conditions in which people who actually do the work in KTM itself live. There really is something quite sickening in the way this stuff is eagerly consumed by middle class people completely oblivious to how the rest of Nepal lives and why they are now fighting for power to change Nepal. Why not go and talk to some of them and find out who they are and why they have brought Nepal to a halt for yourself?